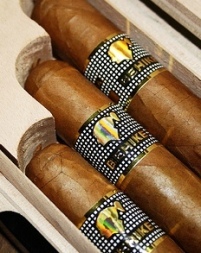 1) The new Cohiba Behike is expected to hit non-U.S. stores in mid-June. Lauded by some as the finest cigar ever produced in Cuba or elsewhere, Behike uses a rare “medio tiempo” leaf and is being advertised as the “new standard among smokers worldwide.” Its name comes from the Tiano word for sorcerer or doctor. While the blend’s three sizes will retail for $36-57 apiece, high demand and low supply make black markets likely in countries where Cubans are legal—and almost certain in America thanks to the trade embargo. 2) The “CAO Invitational” golf tournament, sponsored by Famous Smoke Shop, will tee off Friday, April 16, at the Whitetail Golf Club in Bath, Pennsylvania. The cost of admission ($70 per person) includes greens fees, a post-round dinner, and a CAO goodie bag complete with smokes and swag. 3) Inside the Industry: All but two of the cigar rollers at the El Credito factory in Miami have been let go, Cigar Aficionado reports, as General Cigar transitions the famous space where La Gloria Cubana was created into a cigar lounge. The Cuban Stock Cigar Company is increasing its distribution of Exquisito, Chubbys, Cuban Stock Vintage, Joya de Havana, and Delicioso cigars to 130 stores nationwide. 4) Around the Blogs: Keepers of the Flame examines the science of cigar flavors. Stogie Review lights up the Illusione 88. Cigar Inspector inspects the Velazquez. A Cigar Smoker smokes the CAO Criollo. Tampa Cigar Examiner examines the Upper Cut by Punch. Nice Tight Ash checks out the Arturo Fuente Rosado Gran Reserva. 5) Deal of the Week: We’ve found yet more unpublicized deals from Cuban Crafters. There are a number of discounts, but our favorites are boxes of the Cameroon Cabinet Toro for $70, Cubano Claro Lonsdale for $60, and La Carolina Pyramid for $70. Grab yours here.